A Particle System component simulates fluid entities such as liquids, clouds and flames by generating and animating large numbers of small 2D images in the scene. 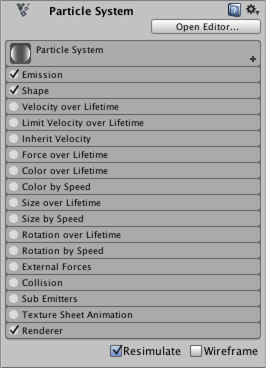 For a full introduction to particle systems and their uses, see the manual page. The Particle System component has many properties and for convenience, the inspector organises them into collapsible sections or “modules”. The modules are documented in separate pages. Each module can be expanded and collapsed by clicking the bar that shows its name. At the left side of the bar is a checkbox that can be used to enable or disable the functionality of the properties in that section. For example, if you don’t want to vary the sizes of particles over their lifetime, you can simply uncheck the Size over lifetime section. Aside from the module bars, the inspector contains a few other controls. The Open Editor button shows the options in a separate editor window that also allows you to edit multiple systems at once. The Resimulate checkbox determines whether or not property changes should be applied immediately to particles already generated by the system (the alternative is that existing particles are left as they are and only the new particles have the changed properties). The Wireframe button shows the outlines of the mesh objects used to show the particles in the scene.